According to Wikipedia, “a Board Portal can be a custom-built, in-house application, an off-the-shelf, commercial application that is deployed by IT, or a subscription-based software as a service (SaaS).” The portal is used to provide information to the board of directors and organize documents used to conduct a meeting. Diligent Corporation (formerly Thompson Reuters Boardlink) has one of the leading SaaS solutions and it is a great product. As an alternative to Diligent, several customers have asked us to compare Office 365 (SharePoint Online) to Diligent’s offering. The purpose of this article to explain the requirements for a board portal and compare features in Diligent and SharePoint Online that meet the requirements for a Board Portal. Both solutions have many advantages over email attachments and printed documents. While Diligent is the leading board portal solution, some of our customers have used other SaaS solutions. Maren, from the Xgility team, built a solution that saved $8,000 annually by replacing BoardEffect with a SharePoint site. The solution was more secure and reduced the number of places employees had to go to save and find information needed to do their job. Strict Security: Due to the sensitive nature of board information, security and confidentiality is critical. Sometimes board portals will use two-factor authentication for user logins, role-based access control to information, and full encryption of stored information and communications between members. Online Accessibility: Board members can review documents or communicate with other members at any time, even when they are on the road. Offline Accessibility: Board members can download documents to their computer for offline review. However, board portals ensure that downloaded documents still support the same strict level of security. Board Packet Creation, Modification, and Distribution: Corporate secretaries can use the board portal to create board materials and disseminate them online. Edits or deletion of documents can be done and the changes are immediately distributed. This saves the hassles associated with printing and handling changes after board packets have been printed. Board packets are often quite thick, with 600 pages on the low-end and as many as 2,000+ pages. Dashboard of Key Performance Indicators: to allow directors a quick view of the KPI of the organization’s performance, a flexible dashboard is often an integral part of Board Portal packages. 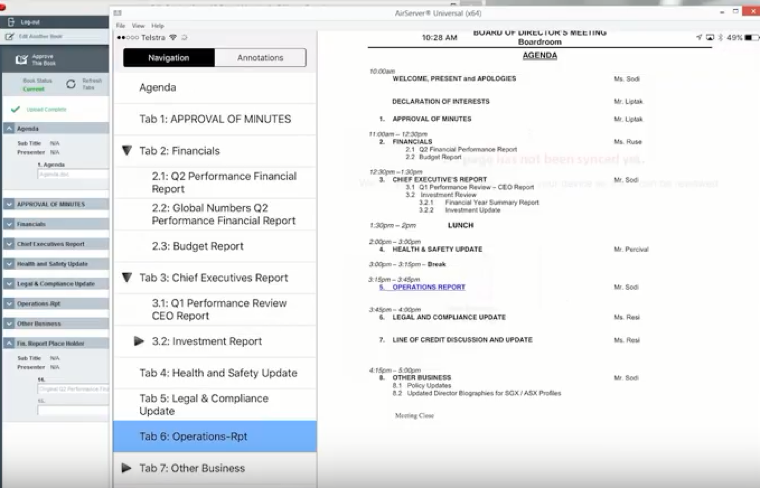 Online Collaboration support allows documents and board packets to allow for directors to record their comments and save a record, while reviewing such information. Data Retention Policy Support: To mitigate company liability, board portals enforce data retention policies on documents, as well as board member communications. Read Receipt of announcements, policy documents and any other legal documents is recorded and maintained by board portals. In reviewing the solution offered by Diligent, their main advantage is that they are a purpose-built SaaS application. They excel at creating a board book, which is the document used by the board to prepare and follow along during a meeting. A typical board book contains the agenda, meeting minutes (including approval), executive management reports, committee reports, new business, and adjournment. The Board Book can be accessed online and offline. Diligent is also known for personalized executive support. Since Diligent is a purpose built application, they meet all of the requirements above. Office 365 can also meet all the requirements for a Board portal, but some configuration is necessary. SharePoint Online is designed as a general purpose, enterprise wide, collaboration system. For many companies, the work needed to customize Office 365 will outweigh the benefits of the point solution offered by Diligent. Office 365 would be a great choice for those looking to have a platform that can be used for the collaboration and creation of the documents that are used to create the board book. With Diligent, documents are typically created outside the application. 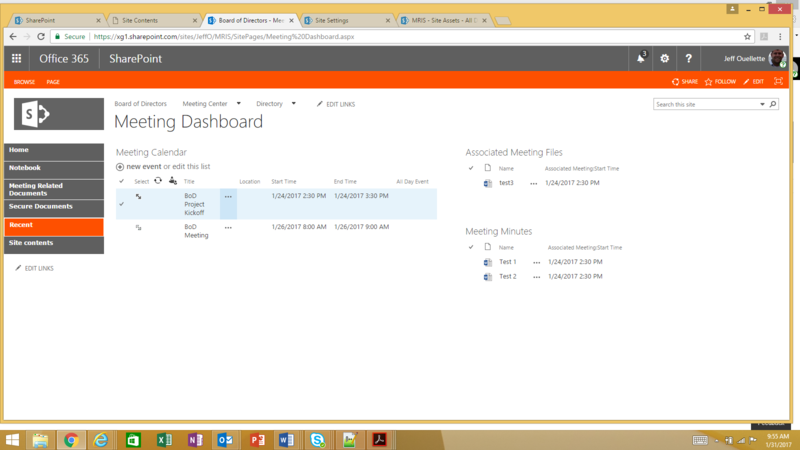 In addition, Office 365 should be used as a collaboration and follow up on action items assigned from the board meeting. For instance, tasks can be assigned to company employees in the portal or new committees can be formed inside the portal. Office 365 out-of-the-box features that would be used for a Board Portal include: calendars, OneNote notebooks, contact list, Outlook meeting invites, workflows, alerts, metadata, tasks, and subsites. Another advantage of Office 365 is tight integration with Office products such as Word, Excel, Outlook, and PowerPoint. Office 365 also has good mobile applications. Some executive administrators may choose to take Notes in OneNote, but distribute the final meeting minutes for approval in Word. In terms of security, I would prefer to trust my sensitive corporate data to a larger SaaS provider such as Microsoft. Microsoft offers great solutions for single sign-on and two factor authentication, along with a very large security team. 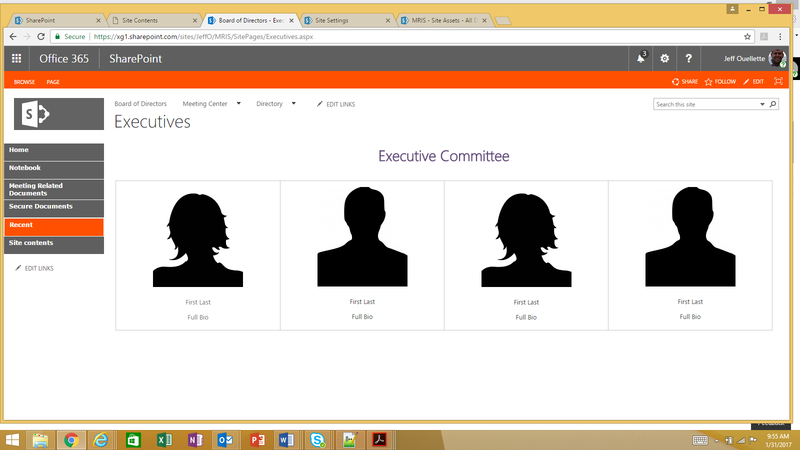 While our typical recommendation is to assign SharePoint permissions based on active directory groups, assigning permissions to individual board members may be a requirement in the board portal. The disadvantage of Office 365 when compared with Diligent is that corporate IT may have train the executive admin team to utilize best practices for security and collaboration. Since Office 365 support is not specific to board portals, training and support should be provided by an expert like Xgility. While some boards may still use paper or email attachments, these methods are likely to cause issues. For instance, this may cause confusion over the latest document version and make it difficult to correct documents at last minute. A Board Portal is a great solution to improve productivity and collaboration for executive staff, as well as to assist with proper governance and oversight. Want a free trial of Office 365? Get your Office 365 E5 trial subscription here. If you are ready to implement a board portal in Office 365 or would like to learn more about Microsoft’s Cloud please contact us.